Welcome to the website of ISTE Kerala Section. The main goal of ISTE is to serve as a common agency for stimulating, guiding and empowering its members to own the responsibilities as facilitators of technical education for the service of mankind and the advancement of general welfare. ISTE strives to improve the quality of technical education in this country by various programmes and tries to inculcate a spirit of fraternity among its members. 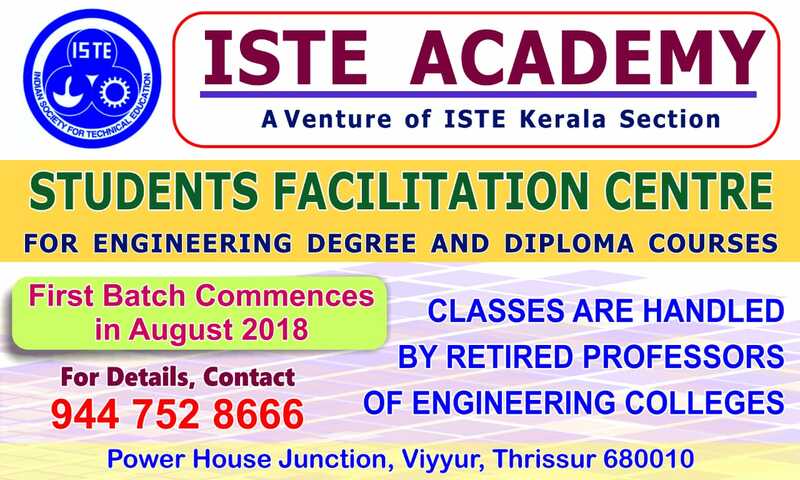 The Kerala section on its part have been in the forefront of action right from the inception of ISTE and even though the size of the section is relatively small, activity wise it has been second to none. In many occasions, Kerala section have taken the lead to show others a way. This website is designed in such a way to provide the basic information regarding the section and its constituent members ( institutional members, chapters, and student chapters). I express my gratitude to all who have put in their efforts towards the realisation of this site. We do not consider this as a complete and perfect site, and welcome your valuable suggestions for improvement. I also request all concerned to mail us the changes for continuously updating the content. Thank you.